Oh checking account, why do you hate me so? Personally, I don’t even understand why you’re called a checking account given that I use my debit card far more than I write checks. I try to love my checking account, reconciling it as often as I remember to do so, but sometimes time just gets away from me. Before I know it, it’s been a week or ten days since my last reconciliation. Itunes: Everyone in our family uses the same Apple ID, which is connected to my checking account. Anytime someone buys a song, an app, or a game, it comes out of the account. Gas: I typically fill up our vehicles with gas using my debit card. Sometimes it posts right away, sometimes it takes a day or two. I seem to always assume that either it will post immediately or I’ll remember the amount. Grocery Store: We try our very best to get all the groceries and household items we need during one gigantic trip to the store on the weekend. But, sometimes we think of an item or two that we forgot, OR we have a slight menu change. Swipe that debit card. Vending Machines: I stopped carrying cash to work so I wouldn’t buy stuff from the vending machines. Then, they installed a new self serve system that allows you to pay with your debit /credit card. I’ve been known to get a soda or a candy bar from time to time. I start at the top, and start recording the transactions in order until I reach the date that I last reconciled the account. I do the subtractions, and 8 times out of 10 it doesn’t match what my bank’s online portal says. I double check the transactions, and realize I accidentally skipped one. More math, but it still doesn’t match. With my face all scrunched up in frustration, I start looking at some of the transactions I just added to my account register realizing that they are duplicates of ones I’d already recorded. I have learned that some of my repeat offenders (Itunes and self-serve break room, I’m looking at YOU) will post immediately as a preauthorization but won’t officially post until a few days later. The date of the transaction will be the date of the official posting, making me sometimes think it is a new transaction. I’ve even seen the transaction post as a preauthorization, then completely disappear for a day, and then post officially post again on a new date. That sort of thing really messes with my head. Reconciling my checking account has become a chore that almost always results in calculator keys being poked at with a much stronger force than necessary, colorful words being recited with each button press for emphasis, and a lot of frustration. The silly thing is that I know the solution, because I’ve done it in the past and it works beautifully. My wife and I used to go over the checking account each morning over breakfast. There weren’t more than one or two transactions posted in a given day, which makes reconciliation very easy. It only took us a few minutes, AND it kept us both on the same page with where we were at with our finances. It’s time to start that routine back up again. Otherwise I’ll be budgeting for a new calculator soon. I don’t check my accounts each day, but at least every second day I do. I tend to charge everything to my credit card, pay it off a few times a month (so I don’t incur interest) and then reconcile at the end of the month. I always check our bank and credit cards once a day as part of my routine, not so much on the weekend, but always during the week. 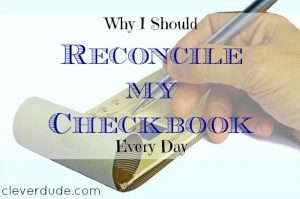 I use my debit card most of the time and I just keep the transaction receipt in my wallet or checkbook – which I carry with me – so each day I record the transactions. Then every few days, I record it all on Quicken and then just reconcile once a month when my statement is ready from the bank. My husband rarely uses the account so we have no problems with him not recording things. Plus, he’s a retired accountant so there’s no way he’s gonna forget…. I remember when back in my high school and college years, balancing my checkbook was so much easier. Add in income from my job and then a withdrawal either by check or ATM. There was no such thing as a debit card. Now with the debit card, you have purchases posting at random times, random holds of $1 to make sure you have cash in the account, etc. It’s no wonder why so many have a hard time balancing accounts. @Daisy – That’s certainly one way to make reconciling your checking account easier. I’d be concerned that I wouldn’t be sticking to my budget if I wasn’t seeing how much money I actually had available in contrast to what I spent – but as long as it works for you! @Cathie – The silly thing is I sit in front of a computer all day as well. You’d think I’d take a minute each day to ensure everything is up to date and correct, but I don’t. I need to get back into the habit! @moneybeagle – I seem to be the opposite…I get to the weekend and think, “wow, I haven’t looked at our checking account all week. I should do that.” I need to get back into the swing of taking a minute or two each day! @Jon – exactly – plus the “moving around” of purchases as I mentioned really gets me. I’ll reconcile my checkbook, and see a purchase from the vending machines at work and enter it in and subtract from the balance. 3 days later the purchase has “disappeared” and I’m off by that purchase. another day and it’s “reappeared” on a brand new day. Drives me NUTS! thanks for stopping by! I need to start reconciling my checkbook more often. I do it at the end of each month but sometimes I fall off the tracks. @suburbanfinance – I would definitely come off the rails if I only did it once a month! Hopefully we can both do a little better!